Snap your Cooks Companion App dish to WIN! Cook and photograph a dish from the Cook’s Companion App to win weekly prizes – plus the chance to have your photo featured in the App. The Cook’s Companion is often referred to as ‘the bible’. With over 2,000 dishes and authoritative information about ingredients, cooking advice and more, its sheer size necessitated a focus on words rather than pictures. But once I decided to offer all of this in a convenient digital format, the opportunity to include photos was irresistible! I cooked hundreds of dishes specifically for the App, which were photographed by professionals. I’m also continually adding iPhone snaps that I take in my own kitchen. But with hundreds of dishes still to be photographed, I think it’s time to get you all involved! Join the #mycooksappdish challenge by cooking a recipe from the Cook’s Companion App that doesn’t already have an image of the dish, and sending me a photo. Each week I’ll pick my favourite photo to win a Prepara iPrep Kitchen Tablet Stand and a Little Moments App by Fat Mum Slim. Plus, the very best images will be selected to appear in the App and become part of this iconic work. The competition officially starts on October 6th … but you can start submitting now! Prepare a favourite dish that you’ve perfected, or experiment and try something new. I’ve included some weekly prompts to help you explore the App and discover hidden gems. 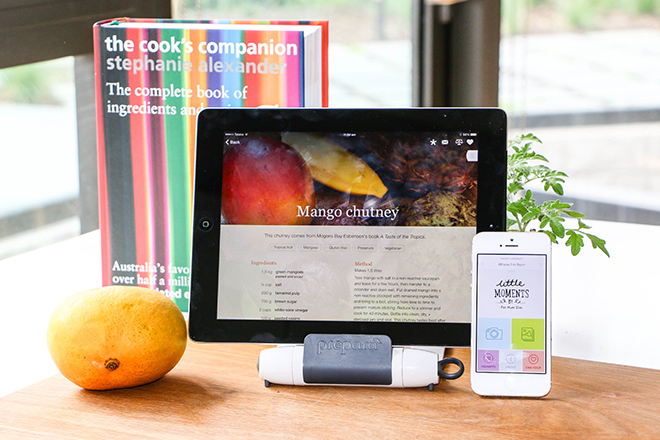 Cook any recipe from the Cook’s Companion App that does NOT already feature a photo of the dish. You can use my weekly prompts to inspire you. If possible, submit two photos: one portrait orientation with the dish at the top of the photo, and one landscape. You don’t need to be a professional photographer: well-lit smartphone photos are fine! Submit your photos via the ENTRY FORM below. Files should be a maximum 5MB. Tweet, Instagram or share your image with the hashtag #mycooksappdish so everyone can see! The competition runs for nine weeks, from 6th October 2014 to 7th December 2014. So you have nine chances to win. Each week, one entrant will win a Prepara iPrep Kitchen Tablet Stand and a Little Moments App to keep you snapping. Enter as many times as you like! From 6th October to 7th December 2014, I am running a photo competition. Cook and photograph any dish from the Cook’s Companion App that doesn’t already have a food-on-plate image to win weekly prizes – plus the chance to have your photo featured in the App. 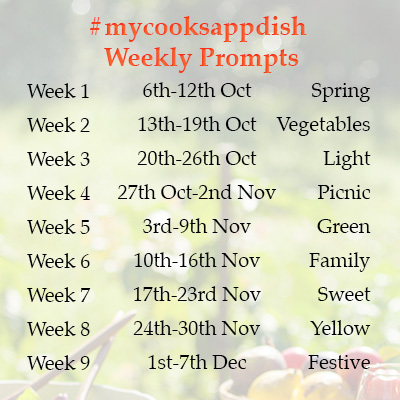 To keep you inspired, each week I have chosen a ‘prompt’ or theme which you can interpret any way you like. Your submission doesn’t have to be inspired by the prompt: it’s simply a guide to get you thinking and exploring the App. You can see all the prompts below, to plan ahead. Enter as many times as you like! To submit your photo. enter here. 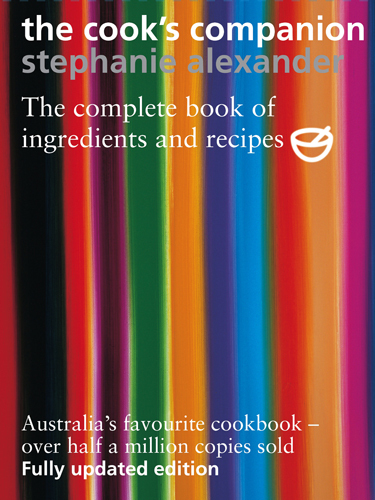 An updated edition of The Cook’s Companion book is available from booksellers today. ‘Why update something that is perfect?’ asked one journalist. A gratifying compliment but nonetheless it is over 10 years since the last revision and things change. I have written two completely new chapters – Grains and Seeds, and another on Bush Foods. There are updates to information on certain products that have gained in importance or familiarity such as Wagyu beef, saltbush lamb, truffles, scampi. Here and there facts as stated are no longer accurate. Pork importation regulations changed in 2005 and 2006 to permit the importation of certain products, most importantly for food lovers Italian prosciutto crudo, and Spanish jamon. There are some new recipes, some rewritten recipes after feedback or after recooking them. And some of the longer marginal recipes have been converted into full recipes. And over and above all of these specifics, every line has been re-read, and many minor text adjustments have been made. The Basics section has been expanded and so on and so on. In answer to the implied question posed by the journalist my answer would be – ‘Given that this book is regarded by so many as an authoritative source, it is very important that it be as up-to-date as possible’. This new version has been endorsed with quotes on the covers from many of my food heroes, which is a wonderful vote of confidence. And in the preparing of this revised text it was possible for me to produce a digital App with the full text as in the book, 400 illustrations and 10 videos, to complement the paper version.